Compare Double Door Haier 320 L Bottom Freezer with Samsung's top rated Fridge 253 L.
You can see list of our Haier HRB-3404BS-R (Bottom Mounted) VS Samsung RT28M3424S8 below, perform Side-by-Side comparison. If you need further help, do have a look at Conzumr Guides and Tips. Alternatively you can view all Refrigerator to choose your own favourites. This samsung double door refrigerator has all-around cooling system cools. 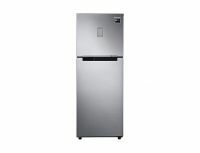 It has capacity of this refrigerator is 253 liter. It comes with tempered glass 2 EA shelf material. This refrigerator has digital inverter technology and interior led light. To Recieve updates and possible rewards for Samsung RT28M3424S8 please sign in. To Recieve updates and possible rewards for Refrigerator please sign in.